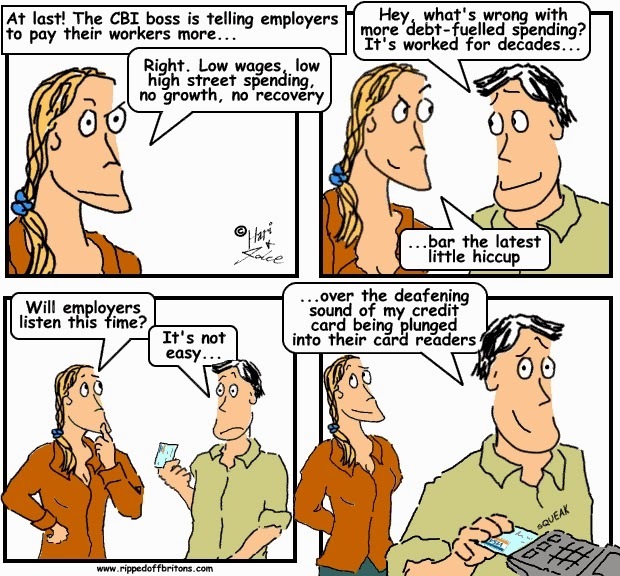 SOURCE GUARDIAN: The CBI, Britain's biggest business lobby group, says "Pay your workers more"John Cridland, director-general of the CBI, Britain's biggest business lobby group, criticised many of the 240,000 companies he is paid to represent for failing to pass on their new-found prosperity to employees. He told employers – whose FTSE 100 bosses are paid 136 times the national average – that they must ensure that all citizens benefit from the recovery. The GMB union warns that the real value of national average earnings has fallen by 14% since the start of the recession in 2008. Real earnings have dropped by more than 20% in London, with workers in Hammersmith and Fulham experiencing a 49% decline. By contrast, the average FTSE 100 boss collected £3.7m last year. Just three months ago Cridland attacked the Labour leader Ed Miliband’s plans for an increase in the minimum wage as a "real setback for Labour's pro-enterprise credentials". He said many companies could not afford to pay employees more than the £6.31 minimum wage for adults, and £5.03 for those aged 18 to 21. Miliband has said he will offer companies tax breaks if they commit to paying workers the living wage, which is set at £7.65 an hour. Most people do not work for FTSE companies, but for struggling smaller businesses. This site is turning into a load of lefty twaddle. CBI boss a lefty? Someone should tell him. I don't think he knows.